This week has been relatively tomato heavy (here and here)! You can never have too much lycopene. We had a new friend for dinner the other night- Dalinda. 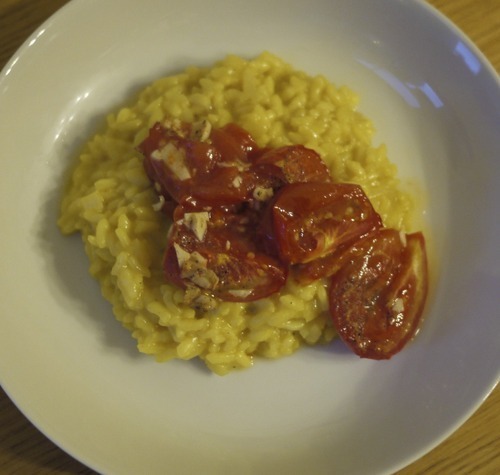 Risotto is a great meal for guests, we can have a glass of wine while stirring constantly and keeping the conversation going. Preheat the oven to 190C/gas 5. For the roasted tomatoes, lightly oil a medium roasting dish. Halve the tomatoes or cut into quarters, and place in the dish. Scatter the garlic and lots of salt and pepper on top, then trickle over the olive oil and sprinkle on the sugar. Roast for about 30 minutes. 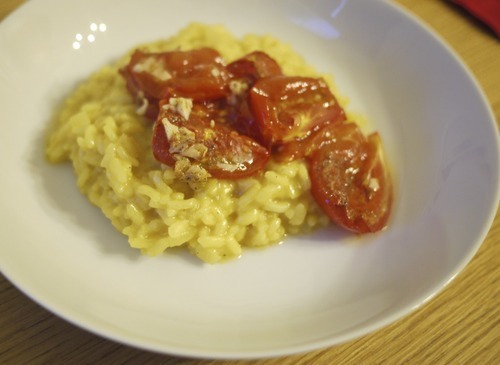 For the risotto, heat a dash of oil with the butter in a large saucepan over a medium heat. Add the onion and saute gently until soft. Put the stock and saffron in another saucepan and bring to a simmer, then keep warm over a low heat. Add the rice to the onions and stir for a minute or two. Pour in the wine and cook until absorbed, then add the bay leaf and/or thyme. Now add the stock, a quarter at a time, keeping the rice at a low simmer, stirring often. Let each batch of stock be absorbed by the rice before you add the next. Continue until creamy, 20–25 minutes. Take off the heat, dot with butter, cover and leave to rest for a couple of minutes.